Thermal Hydraulics of Water-Cooled Nuclear Reactors reviews flow and heat transfer phenomena in nuclear systems and examines the critical contribution of this analysis to nuclear technology development. 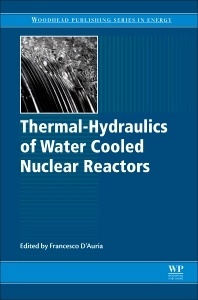 With a strong focus on system thermal hydraulics (SYS TH), the book provides a detailed, yet approachable, presentation of current approaches to reactor thermal hydraulic analysis, also considering the importance of this discipline for the design and operation of safe and efficient water-cooled and moderated reactors. Part One presents the background to nuclear thermal hydraulics, starting with a historical perspective, defining key terms, and considering thermal hydraulics requirements in nuclear technology. Part Two addresses the principles of thermodynamics and relevant target phenomena in nuclear systems. Next, the book focuses on nuclear thermal hydraulics modeling, covering the key areas of heat transfer and pressure drops, then moving on to an introduction to SYS TH and computational fluid dynamics codes. The final part of the book reviews the application of thermal hydraulics in nuclear technology, with chapters on V&V and uncertainty in SYS TH codes, the BEPU approach, and applications to new reactor design, plant lifetime extension, and accident analysis. This book is a valuable resource for academics, graduate students, and professionals studying the thermal hydraulic analysis of nuclear power plants and using SYS TH to demonstrate their safety and acceptability. Francesco D’Auria is a Professor at the University of Pisa, Italy, and Founder and Head of the University’s San Piero a Grado Nuclear Research Group. He was Founder and Editor-in-Chief of the J. Science & Technology of Nuclear Installations (Hindawi) and has been a member of the Advisory Editorial Board of the J. Nuclear Engineering and Design (Elsevier) since 1990. He has been Chairman and/or Organizer of almost 100 sessions in Conferences since 1982 and was recently General Chairman of the ANS NURETH-15 Conference held in Pisa in 2013. He is a Member of the Technical Review Committee of the JANSI (Japan Nuclear Safety Institute), Member of various international groups in IAEA and OECD/NEA, Chair of the ENS TopSafe Conferences of 2008 and 2012 and forthcoming 2017, as well as Foreign Member of the Academy of Science in Buenos Aires. He received several recognitions including the gold medal ‘N. A. Dollezhal’ from NIKIET in Russia. D’Auria is co-author of more than 900 papers (more than 150 of which have been published in International Journals) and more than 1000 reports.